The process of optimising the skills of individuals and institutional support of one or more organisations. The process aiming to facilitate, in liaison with the stakeholders, a merger of their capacities at an individual, organisational and institutional level to allow them to evolve and adapt to new requirements and fulfil their role within a given structure. Pragmatism Build on what already exist. Stressing on the fact that there already is a core of competence to be built upon. Not a wanted ideal to be attained. Means The process of capacity building needs time to have an impact. It is an on going process. Participation Capacity building must be undertaken with participation of the persons or organisations involved. Flexibility and adaptation There are not one solution on how to build capacities. There are an excess of possible strategies, methods and resources focused on changing mentalities. The perfect solution does not exist. 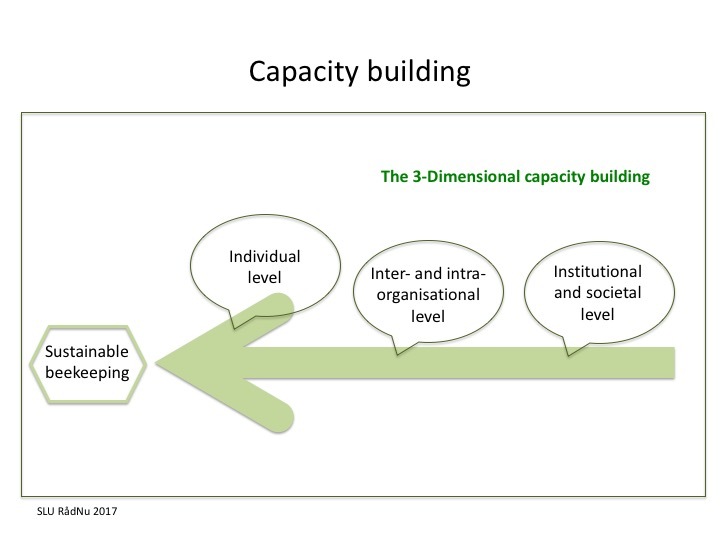 What is Capacity building all about? Creating dynamism and durable apprenticeships, rather than knowledge transfer. Must be based on up to date situation reports. Capacity building is demand orientated. Capacity building is about liberating pre-existing potentials.